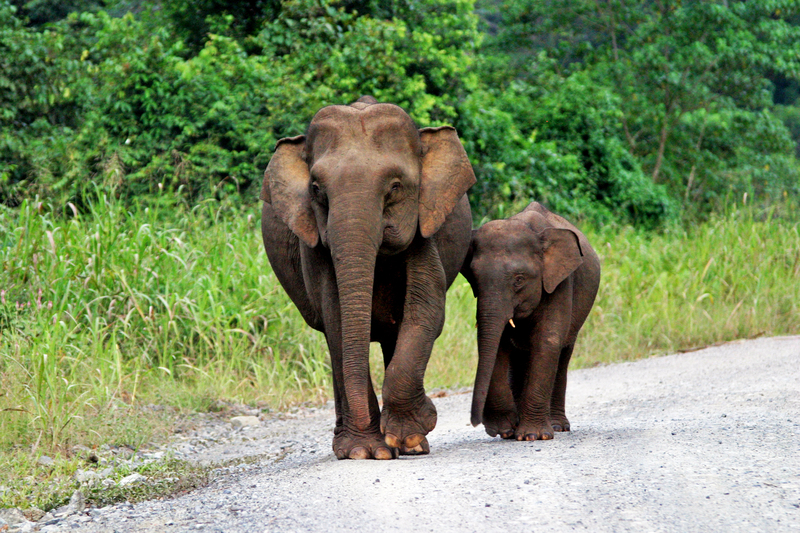 Bornean Pygmy elephant (Elephas maximus borneensis) mother walking with her calf along a road in the Danum Valley Conservation Area, Sabah, North Borneo, Malaysia. The Bornean pygmy elephant is found only in the northeast tip of Borneo, in the Malaysian state of Sabah. In June 2005 a team from the Sabah Wildlife Department in Malaysia and WWFâ€™s Borneo office radio collared five Bornean Pygmy elephants. This was the first ever study of Borneoâ€™s elephants and is the largest study ever undertaken to track Asian elephants using satellite technology. It was not until 2003 that the Bornean Pygmy elephant was scientifically recognised as a sub-species.